The Conduit Carrier Cart is available in six models, ranging in load capacity from 1,500 lb to 6,000 lb. The steel frame, buttressed by extra spanners, will support bulk quantities of rigid steel, PVC, flexible metal, or any other common form of electrical conduit. The Conduit Carrier Cart allows electricians to position whole runs of conduit right at the install site, improving overall job efficiency considerably. 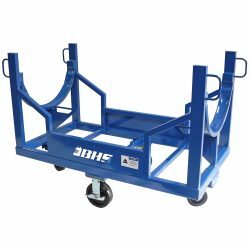 To learn more about how Conduit Carrier Carts and other Electrical Equipment from BHS can improve working conditions in your business, call our sales team at 1.800.BHS.9500.